Bill Clinton was paid at least $26 million in speaking fees by companies and organizations that are also major donors to the foundation he created after leaving the White House, according to a Washington Post analysis of public records and foundation data. The amount, about one-quarter of Clinton’s overall speaking income between 2001 and 2013, demonstrates how closely intertwined Bill and Hillary Clinton’s charitable work has become with their growing personal wealth. The Clintons’ relationships with major funders present an unusual political challenge for Hillary Rodham Clinton. Now that she has formally entered the presidential race, the family may face political pressure and some legal requirements to provide further details of their personal finances and those of the foundation, giving voters a clearer view of the global network of patrons that have supported the Clintons and their work over the past 15 years. 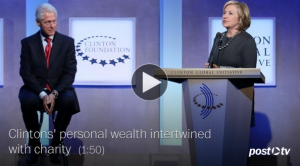 The multiple avenues through which the Clintons and their causes have accepted financial support have provided a variety of ways for wealthy interests in the United States and abroad to build friendly relations with a potential future president. The flow of money also gives political opponents an opportunity to argue that Hillary Clinton would face potential conflicts of interest should she win the White House. Though she did not begin delivering paid speeches or join the foundation until 2013, upon ending her tenure as secretary of state, the proceeds from her husband’s work benefited them both.